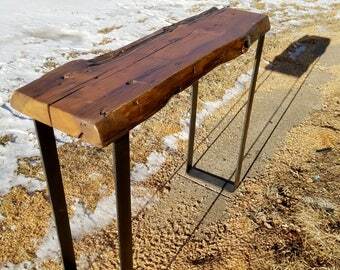 Reclaimed wood console table with lower shelf made from authentic, hand-hewn, salvaged wood from log cabins and barns in the upper Midwest. 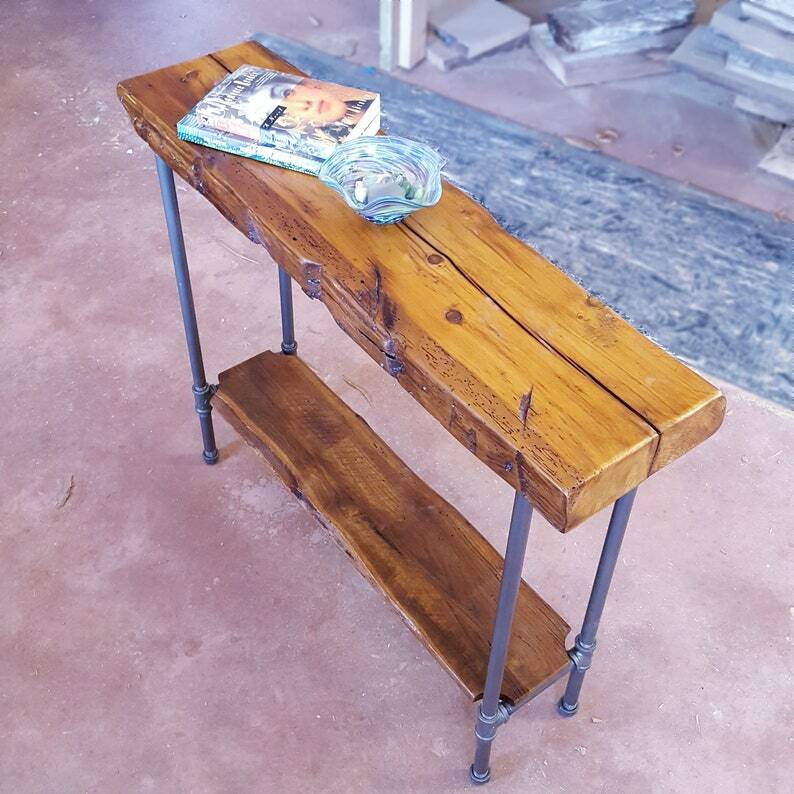 This versatile piece works as an entryway table, wine server, sofa table or sideboard Custom made to your specifications including length, width, height, finish and shelf placement. 3) Choose your finish color from the drop drop menu. The standard finish depicted in the primary photo is called vintage maple, which plays beautifully with the natural variations of the wood. I am happy to custom mix a shade to work with your own furnishings, floors, woodwork etc... Please inquire if interested. 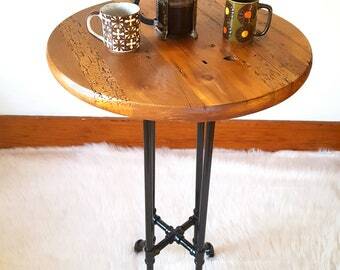 Our hand-hewn tables add an elegant rustic character to your living room or hallway. Can you feel the history, the effort, that went into making each cut as you run your hand over the oiled surface of the table? The perfect combination of modern style and organic subtle touch. A great way to display and serve in your home. The bottom of all the pipe legs has a cap that will allow you to adjust individual leg length to accommodate uneven floors. The leg standard color is a finish called dark bronze. Black is also available. Make a note when ordering if you would like black legs. The legs will ship unattached. Quick assembly with a phillips screwdriver. Holes are predrilled and hardware is included. Adjustable feet will accommodate most floor unevenness. Table looks great. Chris was incredibly patient and helpful throughout the process and ensured that my table was perfect for my needs. Could not recommend more based off the service I received. Thanks!